In order to group opinions into “countries”, a method to determine the “nationality” of every opinion is required. This article describes our approach to partition the vertices into so-called clusters, i.e. disjoint sets of vertices. In graph-theoretic terms, the resulting partitioning of the vertices into clusters is known as clustering. Intuitively, in a good graph clustering the vertices of the same cluster are tightly connected to each other, while the connections between the vertices belonging to different clusters are much looser. There is a multitude of graph clustering algorithms. And for different kinds of data, different distance metrics may be suitable. In an everyday understanding, when we think about distance, we think about the length of the shortest straight line through space between two points (the Euclidean distance). Some clustering algorithms determine a fixed number of clusters on the basis of a graph embedding, taking into account only the spacial positions of the datapoints. The result is a directed acyclic graph or DAG for short. 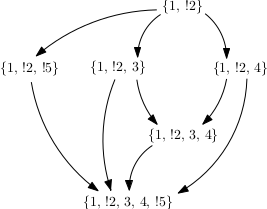 This means, that one cannot start at any vertex and follow a consistently-directed sequence of edges that eventually loops back to the starting vertex. A closer look reveals that the graph is made up of disconnected components. There are also some isolated nodes (the diamond-shaped ones in the drawing). The opinions that are actually drawn on the map are only the isolated nodes and the sink nodes of this DAG. A sink node is a node with only incoming edges (drawn as circles). Internal nodes (with incoming and outgoing edges) and the source nodes (with only outgoing edges) are drawn as rectangles. The latter two node types are considered in the map in the form of vertex weights. By default, every opinion node has a weight of . If it is a non-sink node, it’s weight is distributed evenly among its children. Also, if the same opinion is stated multiple times, a weight of is added to the corresponding vertex each time (or respectively distributed among the children, if it is a non-sink opinion). The sink nodes tend to be the most specific nodes, and the source nodes the most general ones. The source node in the image below is a highly general opinion, that is, which means that the participant suspended judgment with respect to almost every statement. Initially, we collected 210 opinions, two of which where inconsistent. = 161 opinions where sink nodes in the DAG. We then proceeded to calculate the mutual coherence values for all pairs of opinions, yielding a complete graph (i.e. every vertex has an edge to every other vertex) with edges. The edge values given by the degree of mutual coherence are real numbers in the range . However, most clustering and layouting algorithms can deal only with positive edge weights and clustering as applied here does not make sense in a complete graph since it is supposed to find a partition where the intracluster density is higher then the intercluster density. Furthermore, sparsification is necessary for reasons of performance. Therefore we first applied global edge filtering by adding a constant of 0.808 to every edge weight and discarding any edge with a weight that remained negative afterwards. A constant turns every edge weight positive, so the closer to the constant, the more edges are filtered out. The constant of 0.808 was used because with this value, just enough edges were retained for the graph to not decompose into connected components. Furthermore, we applied local edge filtering. For every node the edges with the highest edge weights are marked. is the vertex degree, that is the number of edges incident to . is a constant . This ensures, that for each node, at least one edge is marked. If , all edges are marked. Any edge that has been marked by at least one node is retained while ummarked edges are discarded. We then applied the Infomap clustering algorithm to the filtered country-graph. We used the free graph visualisation software Gephi to test our clustering. The image below shows a visualisation rendered in Gephi. The layout, i.e. the arrangement of vertices and edges in the 2D plane was calculated with Gephi’s inbuilt layouting algorithm Force Atlas 2. The colors are assigned according to the Infomap clustering. As can be seen, the layout and the clustering algorithm are compatible, which is vital in order for the countries to be mostly connected. The vertex radii in this drawing are proportional to the vertex weight. The labels show the initially selected option on the survey. Vegans and vegetarians each form their own clusters. The majority of participants selected “restriced meat consumption”. These, as well as the “omnivore”-opinions where subdivided into two clusters by the algorithm. We performed a semantic analysis of these clusters by hand, by investigating which statements where most frequently rejected and which statements where most frequently accepted. The results are described here.